Last week, we traveled to Lacrosse, WI to work with the Ashley Furniture Leadership Institute and a line up of impressive speakers including Dr. Nido Qubein, David Horsager, and Cam Marston. Over the two days, attendees learned about grit, trust, and a variety of other topics to enhance their leadership skills. 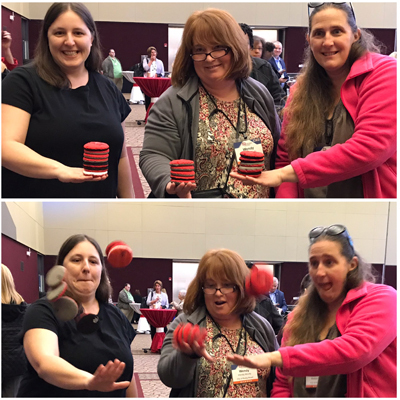 We customized four 20-minute breaks that progressively developed juggling and other physical skills. 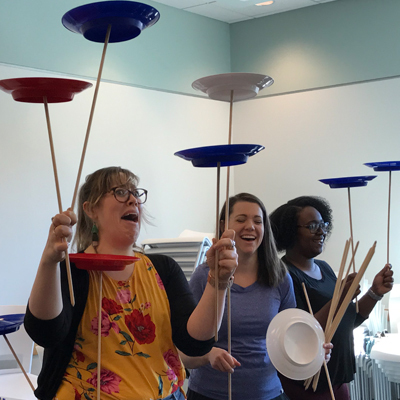 A variety of individual, partner, and group activities strengthened connections between participants, energized the group by getting the blood flowing, and reinforced speaker themes through experiential learning. As an added feature, we custom designed juggling balls, kendama, & flop balls with the Ashley Furniture colors and logo. 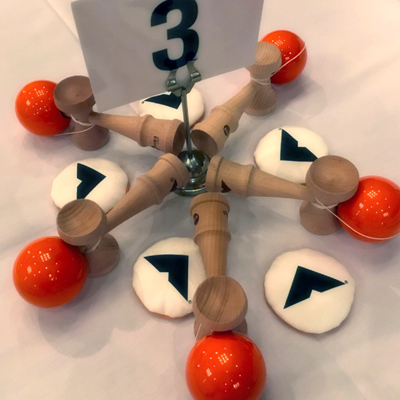 Here's a picture of how we arranged the flop balls and kendamas on each table at the start of the first day.